With the biggest climate conference in more than half a decade less than two weeks away, Republicans in Congress are doing everything within their limited power to make the United States look bad. Rather than push for unity and cooperation at COP21 in Paris, they are trying give the impression that the United States won't live up to its commitments. These attacks extend far beyond just the climate summit or the issue of climate change in general—but into the realm of all scientific inquiry. 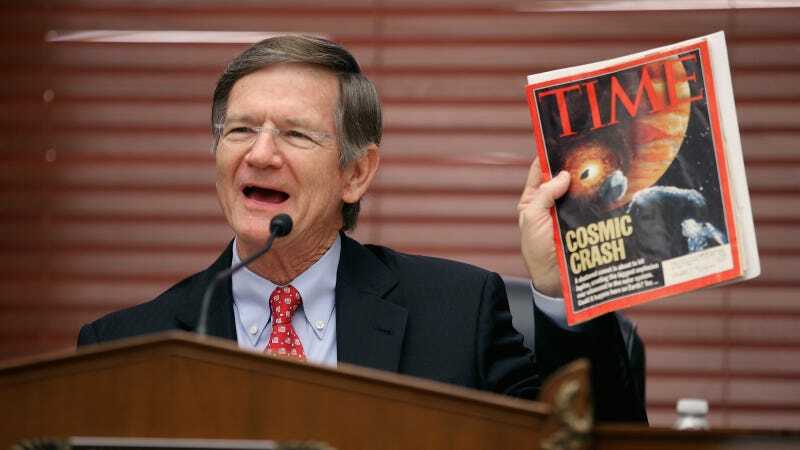 A letter on Thursday from congresswoman Eddie Bernice Johnson (D-TX), the ranking Democrat on the House Committee on Science, Space, and Technology to her fellow Texan and chairman of the committee, Lamar Smith (R-TX), rips into Smith for his recent illegitimate "investigation" (her quotes) into "baseless conspiracy theories" surrounding government scientists. John Cook, a highly regarded climate change researcher and operator of the blog Skeptical Science, which combats climate change misinformation, called the letter "a thing of beauty." Johnson begins by stating the Smith failed to respond to her previous letter concerning National Oceanic and Atmospheric Administration (NOAA) Administrator Dr. Kathryn Sullivan, so she feels compelled to write once again. Sullivan is a PhD geologist, former naval reserve officer, former three-time astronaut and former chief scientist of NOAA. Smith, a climate change denier, has issued a "unilateral subpoena" to Sullivan, but Johnson says his four written demands for the NOAA to comply with his "investigation" never actually identified what it is he was "claiming to investigate." "The only thing you accused the NOAA of doing is engaging in climate science—i.e., doing their jobs," she writes. Now, Johnson says, Smith—who is requesting the email communications of NOAA scientists—is finally claiming to have information showing that NOAA scientists rushed to publication on some a climate study despite concerns and objections from other scientists. However, Johnson says she can't verify the facts of Smith's new whistleblower claims and that "to be frank, this appears to be an after-the-fact attempt to justify a fishing expedition." Whether the fishing expedition is justified or not, Smith has recently taken to the press to voice his opinion on the matter, having written an op-ed in Breitbart, a right-wing news outlet, titled "Changing the data to get climate change." In the article, Smith states that the "NOAA changed the way it has analyzed data for decades to get results that support the president’s agenda," among other accusations. In once fell swoop, you have accused a host of different individuals of wrongdoing. You have accused NOAA's top research scientists of scientific misconduct. By extension, you have also accused the peer-reviewers at one of our nation's most prestigious academic journals, Science, of participating in this misconduct (or at least being too incompetent to notice what was going on). If that weren't enough, you are intimating a grand conspiracy between NOAA and the White House to doctor climate science to advance administration policy. Presumably this accusation extends to Administrator Sullivan herself. All of these indictments are conjured out of thin air, without you presenting any factual basis for these sweeping accusations—exposing this so-called "investigation" for what it truly is: a witch hunt designed to smear the reputations of eminent scientists for partisan gain. Johnson goes on to say that Smith's efforts are generating a number of "misleading" headlines advance of the upcoming climate summit in Paris, and that Smith himself is perpetuating the misinformation by linking to it on the official House science committee website. Republicans are fond of name-dropping the Constitution in these types of polemics, and Johnson says Smith has said the Constitution "undergirds" his Constitutional powers. The Constitution doesn't provide you with a blank check to harass research scientists with whose results you disagree. The Constitution doesn't imbue you with the power to sanction a separate and equal branch of government simply because they won't entertain your baseless conspiracy theories. All of this would seem to necessitate a response from Smith, and wouldn't it be nice to hear his defense. But Johnson suspects her plea for Smith to cease his "investigation" will "fall on deaf ears." I suspect she is correct. In the meantime, top NOAA officials have agreed to start interviews with House investigators, even as their emails remain off limits.